Possible earthlike planet found in the Goldilocks zone of a nearby star! Astronomers have announced the discovery of Gliese 581. NASA's long-lived robotic rover Opportunity is continues to explore Mars. 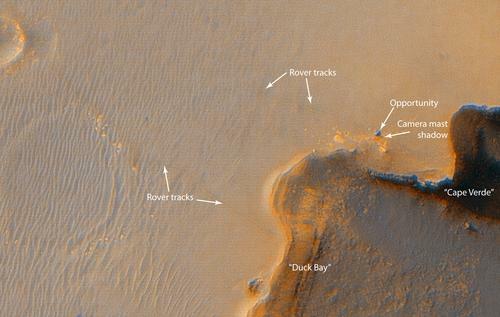 Opportunity has been navigating through a field of small impact craters on her way to Endeavour crater. On Sol 2411 (Nov. 5, 2010), the rover performed an in-place 40-degree turn for communication. This improved the data volume transmitted over the afternoon orbiter Ultra High Frequency relay pass. Then on Sol 2412 (Nov. 6, 2010), Opportunity began her approach to Intrepid crater, a 20-meter (66-foot) diameter crater to the southwest. The rover performed a 96-meter (315-foot) drive, with the last 12 meters (39 feet) of the drive under autonomous navigation. On Sol 2415 (Nov. 9, 2010), Opportunity completed the approach to Intrepid with a 36-meter (118 foot) drive, positioning the rover safely near the crater's rim. Opportunity will spend the next few days imaging the interior of the crater before driving away. As of Sol 2416 (Nov. 10, 2010), solar array energy production was 612 watt-hours with a slightly elevated atmospheric opacity (Tau) of 0.704 and a solar array dust factor of 0.681. Total odometry is 24,946.12 meters (24.95 kilometers, 15.50 miles). Spirit remains silent at her location on the west side of Home Plate. No communication has been received from the rover since Sol 2210 (March 22, 2010). The project continues to listen for Spirit with the Deep Space Network and Mars Odyssey orbiter for autonomous recovery communication from the low-power fault case. The project is also conducting a paging technique called "Sweep & Beep" strategy to stimulate the rover in the case of a mission-clock fault. Total odometry is unchanged at 7,730.50 meters (4.80 miles). "This is a tremendous example of how our Mars missions in orbit and on the surface are designed to reinforce each other and expand our ability to explore and discover," said Doug McCuistion, director of NASA's Mars Exploration Program in Washington. "You can only achieve this compelling level of exploration capability with the sustained exploration approach we are conducting at Mars through integrated orbiters and landers. "The combination of the ground-level and aerial view is much more powerful than either alone," said Steve Squyres of Cornell University, Ithaca, N.Y. Squyres is principal investigator for Opportunity and its twin, Spirit. "If you were a geologist driving up to the edge of a crater in your jeep, the first thing you would do would be to pick up the aerial photo you brought with you and use it to understand what you're seeing from ground level. That's exactly what we're doing here." Within two months after landing on Mars in early 2004, Opportunity found geological evidence for a long-ago environment that was wet. Scientists hope the layers in Victoria will provide new clues about whether that wet environment was persistent, fleeting or cyclical. The rovers have worked on Mars for more than 10 times their originally planned three-month missions. "Opportunity shows a few signs of aging but is in good shape for undertaking exploration of Victoria crater," said John Callas, project manager for the rovers at NASA's Jet Propulsion Laboratory, Pasadena, Calif.
"What we see so far just adds to the excitement. The team has worked heroically for nearly 21 months driving the rover here, and now we're all rewarded with views of a spectacular landscape of nearly 50-foot-thick exposures of layered rock," said Jim Bell of Cornell. Bell is lead scientist for the rovers' panoramic cameras. NASA plans to drive Opportunity from crater ridge to ridge, studying nearby cliffs across the intervening alcoves and looking for safe ways to drive the rover down. "It's like going to the Grand Canyon and seeing what you can from several different overlooks before you walk down," Bell said. The orbiter images will help the team choose which way to send Opportunity around the rim, and where to stop for the best views. Conversely, the rover's ground-level observations of some of the same features will provide useful information for interpreting orbital images. "The ground-truth we get from the rover images and measurements enables us to better interpret features we see elsewhere on Mars, including very rugged and dramatic terrains that we can't currently study on the ground," said Alfred McEwen of the University of Arizona, Tucson. He is principal investigator for the orbiter's High Resolution Imaging Science Experiment camera. JPL manages the rovers and orbiter for NASA's Science Mission Directorate. JPL is a division of the California Institute of Technology in Pasadena.